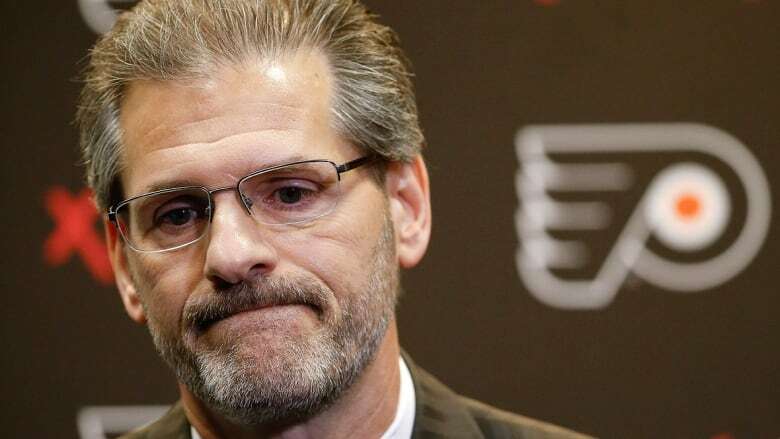 Philadelphia Flyers GM Ron Hextall was fired Monday after 4 1/2 seasons on the job and the NHL team struggling with a 10-11-2 record under head coach Dave Hakstol. Head coach Dave Hakstol has now lost his biggest backer and his job clearly is in danger. The Flyers have a 10-11-2 record and have lost five of six. They are fresh off a 6-0 loss to Toronto in which an organization once stamped as "Broad Street Bullies" played without a penalty. The Flyers play Tuesday against Ottawa at home where a once-rabid fanbase has stayed away from Wells Fargo Center in droves, and the ones that come serenade a listless loss chanting "Fire Hakstol!" The Flyers haven't won a championship since capturing Stanley Cups in 1974 and 1975. They have reached the Finals and lost six times over that span. Sean Couturier, Shayne Gostisbehere, Travis Konecny, Ivan Provorov and Nolan Patrick, the No. 2 pick of the 2017 draft, are among the crop of young players the Flyers counted on Hakstol developing into key cogs on a championship team. The Flyers now have roughly $7 million in salary cap space. "I think Ron has established a philosophy that is probably long overdue," Snider said when he hired Hextall. I have probably been a little too anxious to win another Cup." The Flyers did make the playoffs twice under Hextall but that seemed more of a quirk than a true step toward Eastern Conference contention. The Flyers won 10 straight games in 2016-17 and missed the playoffs; they lost 10 straight last season and made them. The Flyers went 42-26-14 (98 points) last season. The Flyers have lost five of six in large part to a goalie carousel that has yet to stop on a true No. 1. They have Carter Hart pegged as a future star in the minors but tried a stopgap approach this season to give Hart more seasoning. That decision — like the one to remain loyal to the Giroux-Simmons-Voracek core — has flopped. Holmgren brought Hextall back from Los Angeles in 2013 for a year as an assistant GM. Hextall's failure as GM complicates his legacy as one of the more popular players in franchise history. He burst on the scene in 1986, won the Vezina Trophy and helped the Flyers get within one win of the Stanley Cup before losing to Wayne Gretzky and the Edmonton Oilers on the road in Game 7 in 1987. Hextall was the Conn Smythe Trophy winner as MVP of the playoffs that year.